Director/Producer/Story – Irwin Allen, Screenplay – Irwin Allen & Charles Bennett, Photography – Winton Hoch, Underwater Photography – John Lamb, Music – Paul Sawtell & Bert Shefter, Photographic Effects – L.B. Abbott, Makeup – Ben Nye, Art Direction – Herman A. Blumenthal & Jack Martin Smith. Production Company – Windsor. The experimental submarine Seaview emerges from tests under the Arctic ice pack to find the sky on fire due to a passing comet having set the Van Allen radiation belt alight. The Seaview’s designer Admiral Harriman Nelson contrives a plan to save the world by firing atomic missiles at the Van Allen Belt. When there is dissension about the plan in the United Nations, Nelson storms out and sets forth in Seaview to launch the missiles irrespective. The missiles must be launched from the Marianas Trench within sixteen days, before the radiation heats the Earth to fatal levels. As The Seaview races to the Marianas Trench, Nelson must contend with other problems – a crew ready to mutiny because of his iron-handed leadership; a saboteur; a religious fanatic who believes that the launch is against the will of God; pursuing submarines sent to stop them; and attacks by giant octopi. Producer and sometimes director Irwin Allen had a reputation as the crassest of genre producers. The truth is that Irwin Allen was less a filmmaker than he was a showman. The spirit of P.T. Barnum was very much alive and well in Irwin Allen – to Allen everything was spectacle. His disaster movies – The Poseidon Adventure (1972), The Towering Inferno (1974), The Swarm (1978), Beyond the Poseidon Adventure (1979) and The Day the World Ended/When Time Ran Out (1980) – seemed the pinnacle of such showman’s ambition. They allowed Irwin Allen to combine the twin drawcards of big name stars and spectacular boilerplate dramatics. Prior to this, Irwin Allen had made his name with genre tv shows such as Voyage to the Bottom of the Sea (1964-8), Lost in Space (1965-8), The Time Tunnel (1967-8) and Land of the Giants (1968-70). Allen’s tv series can almost be seen as disaster movies for juveniles, where in lieu of the spectacle of overturned passenger liners, burning skyscrapers or rampant swarms of insects, they inflate pseudo-science and mindless flashing lights to the status of spectacle. Voyage to the Bottom of the Sea was the forerunner of the tv series of the same name, which became Irwin Allen’s longest running show. 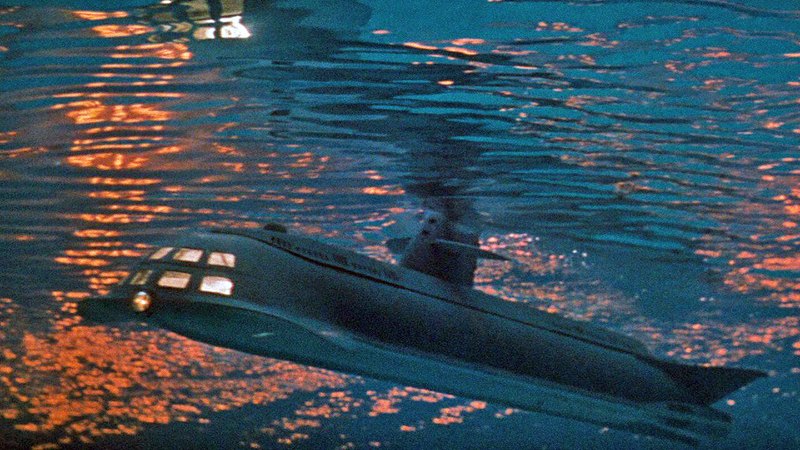 The reason for Allen making the series seems to be based solely on shrewd commercial instinct – that he had expended $400,000 building a model and the interior set of the submarine, it was left over after making the film so why not do something else with it. Voyage to the Bottom of the Sea (the film) is mounted with the dull stolidity familiar to Irwin Allen; indeed, it lays out the blueprint of Allen’s ensuing series – the wooden dialogue and characters, the laughable science and the mindless spectacle of flashing lights. The characters are forthright GI types hewn with shining patriotism – attempts to introduce characterisation with a romance between Barbara Eden and Robert Sterling, or scenes with crewmembers expressing concern about their families have a dreadfully forced embarrassment. The science is, as it always was in Irwin Allen’s science-fiction, laughable – all the talk about a burning Van Allen Belt and being able to blast it away with missiles is remarkable in its pseudo-scientific nonsense. Allen should have been ashamed about his failure to even check the most basic details in his science-fiction (if he did know better, it seems a remarkable contempt for his audience’s intelligence). The film is not without its entertainment value. The middle scenes with the crew tensions pitted against commander Walter Pidgeon’s single-minded determination are conducted with a certain vigour. The effects work is particularly good, notably the scenes of the submarine cruising beneath the surface and the nicely done burning sky effects. Although, the effects do fall down when one sees that the Seaview model has only been built at one size – when it is focused on in tight closeup, the lack of fine detail shows it up as only being a model. The film was later turned into the tv series Voyage to the Bottom of the Sea (1964-8), which lasted for four seasons and 110 episodes. 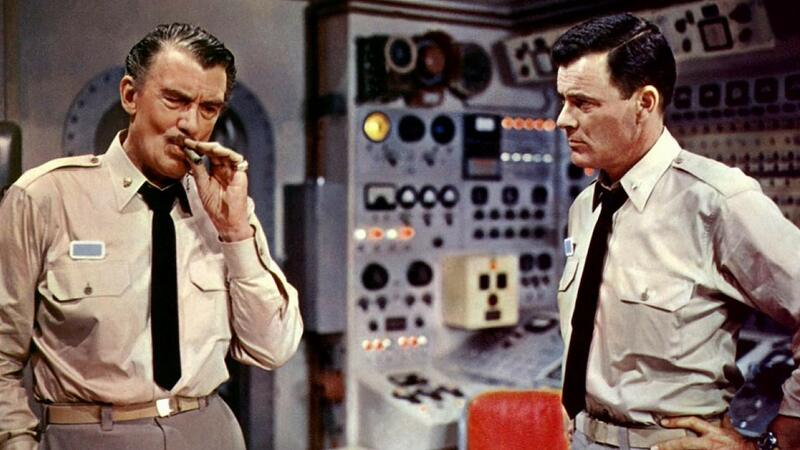 The lead roles of Admiral Nelson and Captain Crane were recast with Richard Basehart and David Hedison respectively. The first season of the series took itself relatively seriously but thereafter the fantastic elements became increasingly improbable and ridiculous with the Seaview crew encountering everything from dinosaurs, invading aliens, mad scientists, revived Nazis, mummies, ghosts, mermaids, a mad toymaker who replaces the crew with puppets, the Yeti, time travellers, an intelligent gorilla, even leprechauns, a lobster man, a revived Blackbeard the Pirate and finding themselves turned into werewolves and wax dummies. Irwin Allen’s other works of genre interest are:– as producer/director/writer of The Story of Mankind (1957) wherein various historical figures up in Heaven debate about whether to destroy humanity, which becomes an opportunity for Allen to rehash stock footage from various historical spectacles; as producer/director/writer of the remake of The Lost World (1960); as producer of the tv series Voyage to the Bottom of the Sea (1964-8), Lost in Space (1965-8), The Time Tunnel (1967) and Land of the Giants (1968-70); as director/producer of City Beneath the Sea/One Hour to Doomsday (1971), a failed tv pilot, which Allen then released cinematically; as producer of The Time Travelers (1976), another unsold tv pilot, written by Rod Serling; as producer of the tv mini-series The Return of Captain Nemo (1978), which was theatrically released internationally as The Amazing Captain Nemo (1978); as director/producer of the notoriously bad killer bee film The Swarm (1978); and as producer of an all-star tv mini-series adaptation of Alice in Wonderland (1985).